Ever since I saw people with loose coins cascading all over the place, I've been on a hunt for cool piggy banks and money boxes. (Of course, you could save your coins in one of those extra coffee mugs you've got - but maybe you'd like a piggy bank.) The piggy banks from Ritzenhoff have to be some of my very favorites. Take a look at the gallery - there are designs to suit a wide range of tastes. The Urban Creature money boxes aren't available yet, but they will be "available soon." [via If It's Hip, It's Here] Update on April 19, 2019: I saw these on sale in March 2010, but I'm no longer finding them. 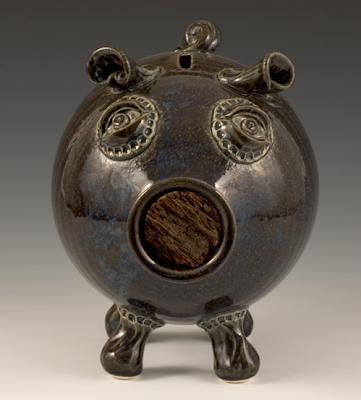 Gallery River Pottery makes some nice piggy banks with cork noses. 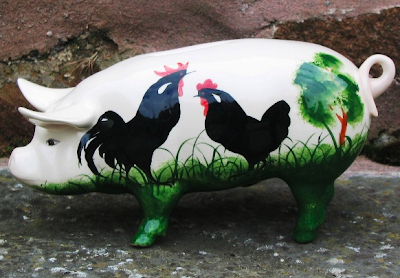 And this piggy bank with the cockerel design comes from Wemyss Ware Studio in Scotland. Update on April 17, 2019: I'm no longer seeing this studio selling banks. 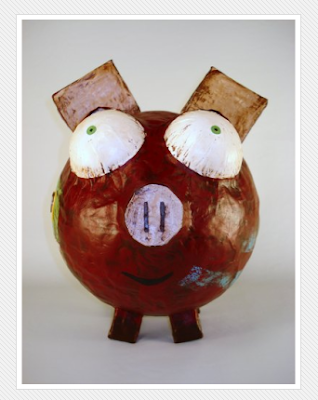 The one-of-a-kind piggy banks from Machadored are hand made from recycled paper and organic paste by Austin Machado Crosthwaite. Update on July 9, 2012: I'm no longer finding these banks anywhere. 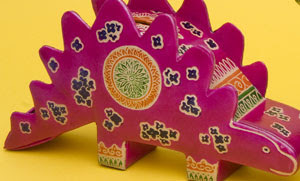 And finally there's this stegosaurus money box, one of the many printed leather animal-shaped money boxes sold by Namaste-UK. You can also get a T-Rex - as well as more prosaic animals, such as an elephant. Update on Oct. 17, 2014: Namaste-UK no longer carries this money box, but you can get it here.